Royal Imports Christmas Holiday LED string light set is a quality product that will surely enhance all your holiday decorations and all other festive occasions. - The festival of joy is never complete without lights, these Warm White LED lights are soothing to the eyes and are a perfect choice to add a warm and charming atmosphere for a classic decoration without being too flashy, the white color also does not restrict you to any specific color theme.Use the LED string light as your elegant decoration to light up your Indoor or Outdoor Christmas celebration, Wedding or Party or venue of choice. - Perfect your house, yard, grass, shops, bars, cafe, restaurant, balcony, walkways. You can twist or wrap it around any shape to light it up. In an outdoor setting, you can simply hang it on small bushes and trees to have a well-lit and beautifully decorated party. 100 LED light bulbs white lights come arranged neatly on a clear wire and offer an elegant look that blends in with all surfaces, backgrounds and settings, the clear wire hides the gaps in the lights and displays beautifully on your walls, ceilings, trees, outdoor reindeer, and many other surfaces. The LED string lights are UL approved for added safety and energy efficient as they consume less electricity, that means a lower electricity bill for you this holiday season, which also means less strain on the environment and nature's resources.The LED string lights has a control box which gives you the freedom of manually setting up your favorite mode whenever you want. Choose from 8 mode lighting pattern options: 1. Comb 2. In Waves 3. Sequential 4. Slo-Glo 5. Chasing/Flash 6. Slow Fade 7. Twinkle/Flash 8. Steady On. Amazingly the last setting will be remembered even if you unplug the strings. No more worries about burned-out bulbs, the lights will remain lit even if one bulb burns out. No need to replace the whole. Waterproof ranking: IP44 (may get rained on but should not be submerged into water). 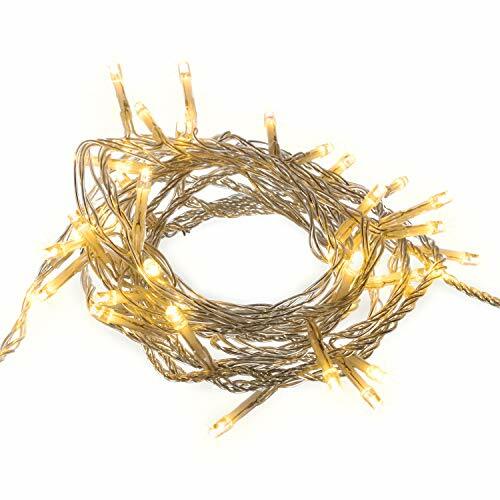 100 LED WARM WHITE STRING LIGHTS: Royal Imports decorative Christmas LED string light set is a quality product that will surely enhance all your holiday decorations and all other festive occasions. - The festival of joy is never complete without lights, these Warm White LED lights are soothing to the eyes and are a perfect choice to add a warm and charming atmosphere for a classic decoration without being too flashy, the white color also does not restrict you to any specific color theme. INDOOR & OUTDOOR DECORATIONS: LED string lights come arranged neatly on a clear wire that blends in with all surfaces. Use it as an elegant decoration to light up your Christmas holiday celebration. Perfect for your house, yard, grass, shops, bars, cafe, restaurant, balcony, walkways . Displays beautifully on your walls, ceilings, outdoor reindeer. You can twist/wrap it around any shape to light it up. Hang it anywhere for a well-lit and beautifully decorated wedding, party or venue of choice. QUALITY - SAFE UL APPROVED - ENERGY EFFICIENT: The LED string lights are UL approved meet national standard for safety. Is energy efficient as they consume less electricity, that means a lower electricity bill for you this holiday season, also puts less strain on the environment and nature's resources. Royal Imports does not compromise on quality so you can rest assured of the products quality. Royal Imports LED String Light Set is worth buying for its quality, functionality and usefulness. EXTENDABLE - NO BURNED OUT BULB PROBLEMS: No more worries about burned-out bulbs, the lights will remain lit even if one bulb burns out. No need to replace the whole strand. - LED string lights is extendable (daisy chained) with its built in end to end connectors for multiple strand attachment (you will need to buy separate units). Simply unscrew both CLEAR end caps and connect. The control box will work for the whole strand. 8 MODE PATTERN SETTINGS: The LED string lights has a control box which gives you the freedom of manually setting up your favorite mode whenever you want. Choose from 8 mode lighting pattern options: 1. Comb 2. In Waves 3. Sequential 4. Slo-Glo 5. Chasing/Flash 6. Slow Fade 7. Twinkle/Flash 8. Steady On. Amazingly the last setting will be remembered even if you unplug the strings. If extended the control box will work for the whole strand.